Art 6 Edition NOTE: You are purchasing a standalone product; MyArtsLab does not come packaged with this content. If you would like to purchase both the physical text and MyArtsLab, search for ISBN-10: 0134127137 / ISBN-13: 9780134127132. That package includes ISBN-10: 0133843750 / ISBN-13: 9780133843750 and ISBN-10: 0133847896 / ISBN-13: 9780133847895. MyArtsLab should only be purchased when required by an instructor. 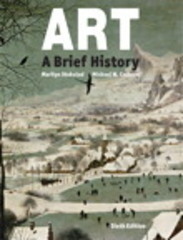 For Art History Survey courses The most student-friendly, contextual, and inclusive art history survey text on the market Now in its sixth edition, Art: A Brief History continues to balance formal analysis with contextual art history in order to engage a diverse student audience. Authors Marilyn Stokstad and Michael Cothren, both scholars as well as teachers, share a common vision that survey courses should be filled with as much enjoyment as learning, and that they should foster an enthusiastic, as well as an educated, public for the visual arts. By treating the visual arts as one component of a vibrant cultural landscape (which also includes politics, religion, economics, and more), Art: A Brief History helps students recognize and appreciate the central role that art and architecture have played in human history. Also available with MyArtsLab® MyArtsLab for the Art History Survey course extends learning online, engaging students and improving results. Media resources with assignments bring concepts to life, and offer students opportunities to practice applying what they’ve learned. And the Writing Space helps educators develop and assess concept mastery and critical thinking through writing, quickly and easily. Please note: this version of MyArtsLab does not include an eText. Art: A Brief History, Sixth Edition is also available via REVEL™, an immersive learning experience designed for the way today's students read, think, and learn.